QueryExecution represents the execution pipeline of a structured query (as a Dataset) with execution stages (phases). When you execute an operator on a Dataset it triggers query execution that gives the good ol&apos; RDD of internal binary rows, i.e. RDD[InternalRow], that is Spark’s execution plan followed by executing an RDD action and so the result of the structured query. You can access the QueryExecution of a Dataset using queryExecution attribute. QueryExecution is the result of executing a LogicalPlan in a SparkSession (and so you could create a Dataset from a logical operator or use the QueryExecution after executing a logical operator). Analyzed logical plan that has passed Analyzer&apos;s check rules. Beside analyzed, you can use Dataset.explain basic action (with extended flag enabled) or SQL’s EXPLAIN EXTENDED to see the analyzed logical plan of a structured query. analyzed logical plan after CacheManager was requested to replace logical query segments with cached query plans. withCachedData makes sure that the logical plan was analyzed and uses supported operations only. 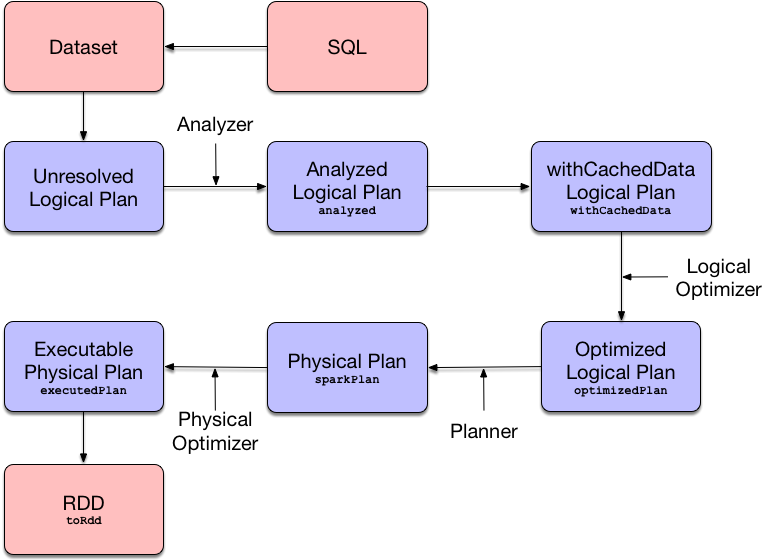 Optimized logical plan that is the result of executing the logical query plan optimizer on the withCachedData logical plan. Physical plan (after SparkPlanner has planned the optimized logical plan). sparkPlan is the first physical plan from the collection of all possible physical plans. It is guaranteed that Catalyst’s QueryPlanner (which SparkPlanner extends) will always generate at least one physical plan. Optimized physical query plan that is in the final optimized "shape" and therefore ready for execution, i.e. the physical sparkPlan with physical preparation rules applied. Amongst the physical optimization rules that executedPlan phase triggers is the CollapseCodegenStages physical preparation rule that collapses physical operators that support code generation together as a WholeStageCodegenExec operator. RDD of internal binary rows (i.e. RDD[InternalRow]) after executing the executedPlan. The RDD is the top-level RDD of the DAG of RDDs (that represent physical operators). toRdd is a "boundary" between two Spark modules: Spark SQL and Spark Core. After you have executed toRdd (directly or not), you basically "leave" Spark SQL’s Dataset world and "enter" Spark Core’s RDD space. toRdd triggers a structured query execution (i.e. physical planning, but not execution of the plan) using SparkPlan.execute that recursively triggers execution of every child physical operator in the physical plan tree. You can use SparkSession.internalCreateDataFrame to apply a schema to an RDD[InternalRow]. Use Dataset.rdd to access the RDD[InternalRow] with internal binary rows deserialized to a Scala type. QueryExecution uses the Catalyst Query Optimizer and Tungsten for better structured query performance. QueryExecution uses the input SparkSession to access the current SparkPlanner (through SessionState) when it is created. It then computes a SparkPlan (a PhysicalPlan exactly) using the planner. It is available as the sparkPlan attribute. A variant of QueryExecution that Spark Structured Streaming uses for query planning is IncrementalExecution. Refer to IncrementalExecution — QueryExecution of Streaming Datasets in the Spark Structured Streaming gitbook. Use explain operator to know about the logical and physical plans of a Dataset. QueryExecution belongs to org.apache.spark.sql.execution package. QueryExecution is a transient feature of a Dataset, i.e. it is not preserved across serializations. stringWithStats is used exclusively when ExplainCommand logical command is executed (with cost flag enabled). preparations is the set of the physical query optimization rules that transform a physical query plan to be more efficient and optimized for execution (i.e. Rule[SparkPlan]). prepareForExecution takes physical preparation rules and applies them one by one to the input physical plan. prepareForExecution is used exclusively when QueryExecution is requested to prepare the physical plan for execution. assertSupported is used exclusively when QueryExecution is requested for withCachedData logical plan. assertAnalyzed triggers initialization of analyzed (which is almost like executing it). assertAnalyzed executes analyzed by accessing it and throwing the result away. Since analyzed is a lazy value in Scala, it will then get initialized for the first time and stays so forever. assertAnalyzed then requests Analyzer to validate analysis of the logical plan (i.e. analyzed). assertAnalyzed uses SparkSession to access the current SessionState that it then uses to access the Analyzer. In Scala the access path looks as follows. In case of any AnalysisException, assertAnalyzed creates a new AnalysisException to make sure that it holds analyzed and reports it. toStringWithStats is a mere alias for completeString with appendStats flag enabled. toStringWithStats is a custom toString with cost statistics. toStringWithStats is used exclusively when ExplainCommand is executed (only when cost attribute is enabled). hiveResultString returns the result as a Hive-compatible output format. Internally, hiveResultString transformation the SparkPlan. Executes DescribeTableCommand and transforms every Row to a Hive-compatible output format. Executes ExecutedCommandExec and transforms the result to a collection of table names. Executes SparkPlan and transforms the result to a Hive-compatible output format. hiveResultString is used exclusively when SparkSQLDriver (of ThriftServer) runs a command. toString is part of Java’s Object Contract to…​FIXME. toString is a mere alias for completeString with appendStats flag disabled. toString is on the "other" side of toStringWithStats which has appendStats flag enabled. simpleString requests the optimized SparkPlan for the text representation (of all nodes in the query tree) with verbose flag turned off. In the end, simpleString adds == Physical Plan == header to the text representation and redacts sensitive information. withRedaction takes the value of spark.sql.redaction.string.regex configuration property (as the regular expression to point at sensitive information) and requests Spark Core’s Utils to redact sensitive information in the input message. Internally, Spark Core’s Utils.redact uses Java’s Regex.replaceAllIn to replace all matches of a pattern with a string. withRedaction is used when QueryExecution is requested for the simple, extended and with statistics text representations.